Juliet Grey has extensively researched European royal history and is a particular devotee of Marie Antoinette. She and her husband divide their time between New York City and southern Vermont. Historical fiction. That is a genre of writing that I fell in love with when I started blogging. All kinds of historical fiction make their way to my shelves and Nook. So, it was without hesitation that I signed up to be a reviewer for this new novel by Juliet Grey. Both the novel, and the author are new to me, and I couldn’t wait to crack the spine on this one. I was not disappointed in any way with this amazingly written, richly detailed, history filled novel. Juliet Grey did a fascinating job on this creation of this story. Maria Antonia, Austrian princess. What an amazing person. I absolutely loved each detail the Grey put into her. I could feel her emotions, and her struggles as she grew from Maria Antonia to Marie Antoinette, Queen of France. I can’t imagine going through the things she, being married off at 14 years old, and dealing with French court while still a child. It amazes me to see how vivid Grey made the French court. I felt as if I, myself, was a member of Marie Antoinette’s society and court. Wow! 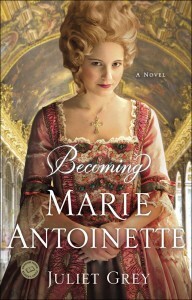 Not only did I love Maria Antonia and her transformation, I loved the setting of the story, I loved the fact that this is the first in a trilogy. It’s a fantabulous start and one that will be forever on my bookshelf. It’s a story that will keep you up late into the night, and turning the pages, wanting, NEEDING to know what young Marie was dealing with. I highly, highly recommend this with a high 5 Book Rating. You’ll be instantly transported to another place in time, and you’ll put on the amazingly detailed dresses of the era, and walk the courts along side this Queen. But, be warned: this is a book to be read when you have LOTS of free time, as you’ll become completely lost in the writing of Ms. Grey. I can’t wait until the second book in this trilogy releases!